In the Province of Trapani, a bridge over the Torrente Pispina. and the parapet, an upended stretch of Roman road. The time is 1926 (Year Four of the Fascist Era). And the place is a barely two-lane bridge over a rivulet in northwestern Sicily - where you see rocky crags, vineyards and marshland all at once. Province of Trapani, Bridge over the Torrente Pispina. You are between Segesta and Calatafimi - barely four miles apart on the old road. beneath the overlay of modern highways. Segesta and Calatafimi? What do these two localities have in common? Nothing really... Except geographic proximity. And their own distinct places on the map of historic memory. 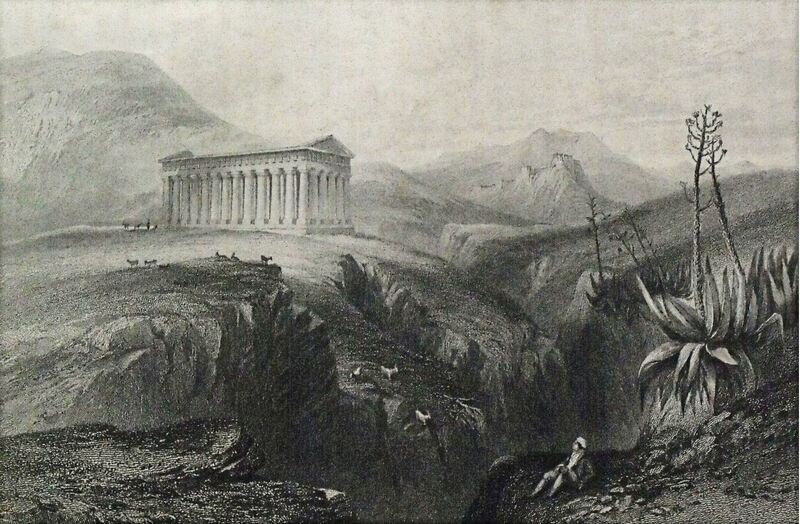 The Temple of Segesta in an early steel engraving (1841). Segesta was the principal city of the Elimi, an ancient Sicilian people - dating back at least to the Tenth Century B.C. A large theater and a breath-taking Doric Temple remain above ground, in a setting of astonishing natural beauty. 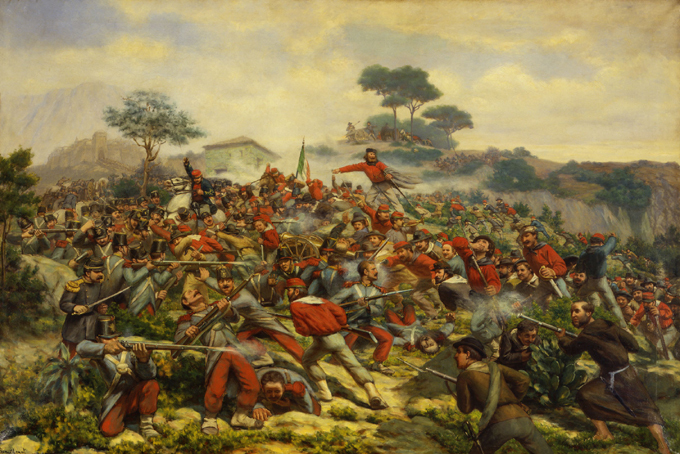 with Giuseppe Garibaldi leading the fight. Calatafimi is a lively small town, founded by the Arabs - who called it Kalat-al-fimi (Castle of Eufemius), evidently alluding to a previous Roman or Byzantine fortification. Little was heard of the place, however, until 15 May 1860 when Giuseppe Garibaldi and his thousand red-shirts engaged the forces of the Bourbon Kings - leading the way to the unification of Italy. the eternally youthful spirit of Italic Heroism. Calatafimi already had its share of older nationalist monuments - some of them decidedly odd. But it was left to Benito Mussolini to incorporate this town into his new narrative of fascist state-building. Mussolini's interventions were certainly bold - and more important, instantly recognizable. The Duce was still in the full flush of his transient love affair with the Futurist avant garde. A public fountain in Calatafimi. Resulting in the arrival of astounding déco baubles in a place that was still nearer North Africa than Milan or Turin (not to mention Paris, New York or Weimar). Shapes of the Future. Public art in Calatafimi. But how do you get from Segesta to Calatafimi (or Calatafimi to Segesta)? Without losing track of the official story line? You have the leit motif of Ancient Nobility to connect things up. And a flurry of fasces to show the way. A baluster on the Pispina bridge - with fasces. At Segesta, fasces left and right. On the stele: Medusa above, Fasces below. In fact, the Theater was first excavated in 1927 - a year before the sign was put in place. Yet another link in the chain of "Ancient Nobility". And a proud fascist achievement. excavation near the Theater of Segesta. Q. "How lame is it to wear an Uxmal t-shirt at Segesta?" That temple is exquisite. My parents always said the best Greek temples are in Sicily and they weren't lying. I love this phrasing: "A tricolore awaits the next breeze...." It's perfectly descriptive and perfectly poetic at the same time. Oh, and it is definitely not lame to wear an Uxmal t-shirt at Segesta. As long as you don't wear the t-shirt of the band you're going to see in concert, you're off the hook. I will see about pulling out some of our photos from Catania, Selinunte, Siracusa, Agrigento and Megara Hyblaea. Or perhaps even reach back farther into our files from the Western Aegean. It's a close contest whether the best Greek sites are in Sicily or Turkey--although we can certainly agree that they are not in Greece! From what we saw of the concert schedule on the "Greek Theater Circuit" in Sicily, the bands are all not-for-export Italian products. (Not even Eros Ramazzotti! )So, the temptation for t-shirt silliness is easily overcome. But, consider this, what if you wrote a catchier title? I am not saying your information isn't solid., however what if you added a headline that grabbed people's attention? I mean "MUSSOLINI (RE)WRITES HISTORY (Segesta/ Calatafimi)" is kinda vanilla. Thanks, Anonymous! I am always grateful for ideas for taking this blog to the next level...even if you are a troll plugging probably bootleg sports shoes. Interesting site. Just recently I've been conducting a genealogical search that leads me to Calatafimi-Segesta. My paternal grandfather Rocco Acesta hails from Calatafimi. The name Acesta is also referred to in several English translations of Virgil's Aeneid. According to these translations the city of Acesta was founded by King Acestes in the province of Trapani sometime after the fall of Troy at exactly the location of present day Segesta. From what I've learned there seems to be some disagreement among scholars about the veracity of the name Acesta as Segesta's earlier name. It seems to me to be more than just coincidental. Thanks, Steven! I see that there is a raging Egesta vs. Acesta debate, regarding the ancient name of Segesta. Although I don't know much about Sicilian dialects (not to mention Greek or Elimite dialects), I am willing to bet that this is a moot question--with Egesta and Acesta overlapping linguistically and for all intents and purposes being the same name. I also see that Calatafimi comes from the Arabic Kalat-al-Fimi (Castle of Eufemio). In any case, it is a wonderful part of the world!